An Interview with Author Dave Bench! This week, it looks like I'm interviewing not one, but two of my fellow children's authors! On Saturday, I interviewed Segilola Salami, and today I'll be interviewing children's illustrator and soon-to-be author Dave Bench! Dave has illustrated a book for his wife, and he is working on a book of his own, which is due to be released later this month. You can connect with Dave on Twitter and Goodreads. Thanks for talking with me today, Dave! Born & raised in Salt Lake City, Utah. I've been an avid reader all my life and also had an interest in drawing and art from an early age. 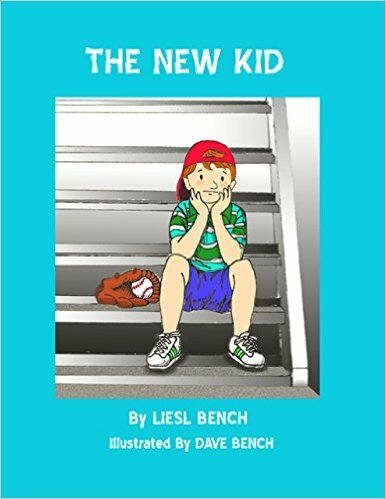 I've illustrated "The New Kid" by my wife Liesl. This is an early reader book about the struggles of moving and making new friends. I'm currently illustrating a book of my own called "Take Me to the Zoo!" The New Kid is listed as ages 3-5. Take Me to the Zoo is probably more for 5-8 year olds. "The New Kid" was inspired by our son's struggles when we moved across town when he was 7. He stressed about leaving the only home and neighborhood he had known. Making new friends was hard at first but he eventually met some kids he could relate to and they are still his friends nearly 20 years later. "Take Me to the Zoo!" is for my granddaughter, Isabelle, who just turned 3. She loves having Grandma or Grandpa read to her! "The New Kid" involves Randy, a red headed kid who loves baseball, a bigger kid named T.J. who likes skateboarding and most other sports, and Einstein, who is a little skinny and maybe a little nerdy. When my wife originally wrote the book on 3x5 cards there wasn't much detail about the characters, other that Randy wears a baseball cap backward and Einstein has glasses. I drew him with an unruly mop of light blonde hair as an homage to the real Einstein, as well as one of my best friends growing up. I wrote a lot of short stories in Junior High and High School, but sort of let it go as an adult. With the advent of self-publishing I see an opportunity for a creative outlet and a way to share my talent with others. Anything by Stephen King or Dean Koontz for the spooky suspense. I like historical fiction and recently read "To Live Out Loud" by Paulette Mahurin. It's the story of Alfred Dreyfus, who was unjustly sentenced to life imprisonment on a desolate island, and Emile Zola's efforts to bring justice to him and his family. I have always loved "Where the Wild Things Are" and hoped someday to produce something as lasting and universally popular. If you could meet any famous author - living or dead - who would it be and why? I would love to meet Earnest Hemingway. He wrote some amazing stories and led a very interesting and adventurous early life.